and should probably be doing something else. … dat means it’s nighttime. So sayeth (saith?) Vorlon, quoting from Blue’s Clues. Yep, when I went out for my run this morning at 7:15 or so, it was still dark. Which makes the motivation to go out kind of weak. On the plus side, I got to see the sunrise from the indoor track at the Rec Centre. 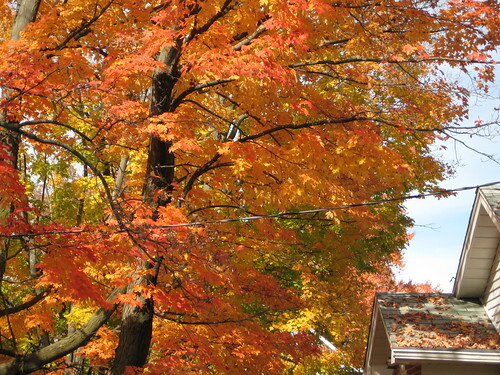 This week, all those leaves are gone, and the world is starting to look pretty dreary. Though it’s not there yet. There are still a lot of leaves on some trees. But November’s coming. And November is pretty much a writeoff, weather-wise. Really, if my birthday weren’t in it, it would be a total wash. But I digress. I’ve made stuff. I haven’t finished anything. Zebula’s hat is still languishing in my purse, because I’m all enamoured with my Yosemite. It’s coming along quite nicely, and I think it’ll be a good size – skimming but not clingy. 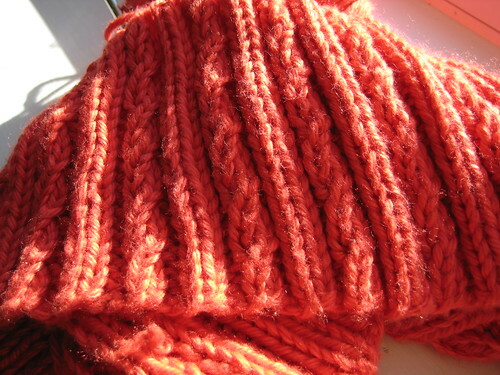 I’ve added 2″ of short rows in the bust area, so it should sit pretty well. One snag. I have about 1/4 of the yarn left that I need to finish. It never occurred to me that since the sweater I unraveled to make this one was shorter, I would need more yarn (duh), and in my defense, I did think I had an extra ball. However I didn’t, and ordered extra this morning. I hope the dye lots aren’t too jarringly different. I’ve been spinning, as I mentioned. 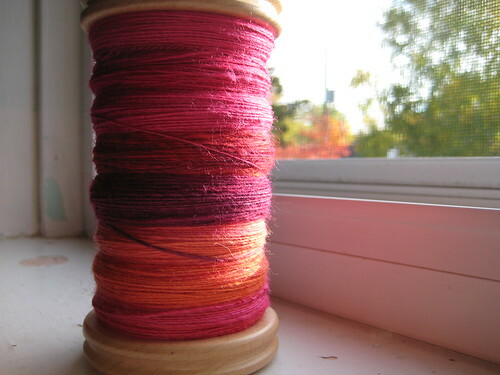 I plied some spare bobbins. I now have about 84m of 3-ply that I made from a roving I bought about 8 years ago. Some of it had been turned into a hat for Zebula (then Vorlon used it, and then it got passed on to a friend’s friend’s baby). I still had some left. Now with this stuff, I should have enough to make something like kids’ mittens. I love it! I started this bobbin about a year ago. I finished it off last weekend, and have done about half of another bobbin since. This will be plied into something that is probably sport weight. I’m not sure what I’ll do with it yet. Ten years ago, I wouldn’t be caught dead wearing orange or pink individually, let alone together. I’ve grown! Incidentally? I hate that song. It’s a beautiful day out! I know my last post started with ‘it’s getting cold’. Well, now it’s sunny and 25 degrees. October in Ontario… I’m feeling kind of sheepish about having taken all the winter stuff out of storage though we’ll need it again soon I’m sure. 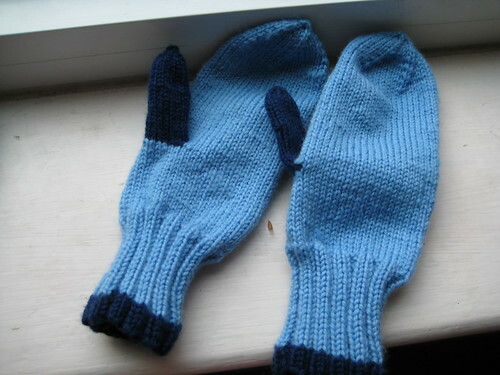 I didn’t manage to make a second pair of mittens for Zebula. There’s not enough yarn for that. So I’m about halfway through making her a hat instead. I’m actually kind of glad, cause I was good and sick of making mittens. 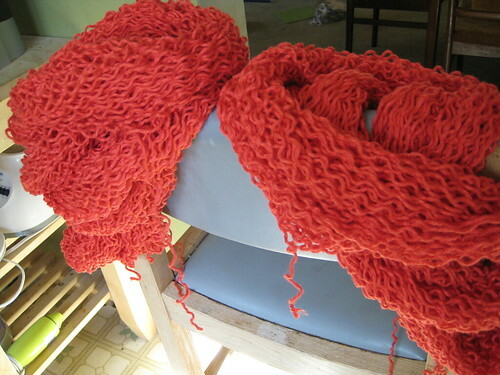 This pile of ramen noodle-looking yarn is my former Bombshell (Ravelry link, sorry). I’d made it last winter, and it just never fit right. I wore it once, spent all my time hiking it up, and got sick of it. I have decided to make Yosemite instead, so I just unravelled the whole thing, skeined and washed the yarn, and rewound it into balls (much to the delight of my children who think winding balls of yarn is the best entertainment, ever). 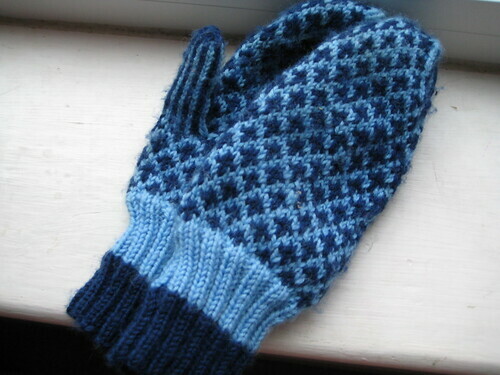 The yarn is Knitpicks Shine Worsted (cotton and Modal). I read the notes and errata in the Ravelry entry for the sweater, and cast on for a Medium, since it said that you should go down a size from what you think you’ll need from your measurements. If you know me, you know that I’m pretty far removed from being a size Medium. Anyway, I got about six inches in, found I’d made a mistake and took the knitting off the needles to rip it back a few rows. Tried it on for kicks and realized it was way too big. So I unraveled the whole thing and have cast on for a Small. Crazy. Anyway, it’s coming along nicely. I’ve started spinning again! During lost moments (read: when I’m waiting for Vorlon to finish in the bathroom, a sometimes lengthy process). I was surprised to find the current singles on the bobbin hasn’t been devoured by moths, so I decided to keep going. We’ll see what comes of it. This holiday weekend is shaping up nicely. We all slept in a little this morning, and I made crêpes for breakfast. We’ve been doing some yard work and odd jobs and just relaxing. I’m singing a concert tonight (come listen!). My brother and his family were going to come visit, but bailed in the end so that they could just have a restful holiday. So no big feast. We’re having a couple friends over for dinner tomorrow, and Monday will be just us. Oh, and due to a miscommunication between me and Dr. Thingo when I sent him to get the veggies from the local buyers’s club yesterday, I have ten (ten!) squashes to deal with. And I also have a (planned) box of McIntosh apples to turn to applesauce. So maybe I’ll spend Monday dealing with those, which seems a fitting way to spend Thanksgiving. It’s getting cold out there! I bring you mittens. I have started her second pair. Same yarn (Dalegarn Baby Ull. Did I mention that’s what I was using? It’s the same for Vorlon’s mittens). I easily got two pairs out of Vorlon’s two balls of yarn, and I think I can squeeze two pairs out of Zebula’s. 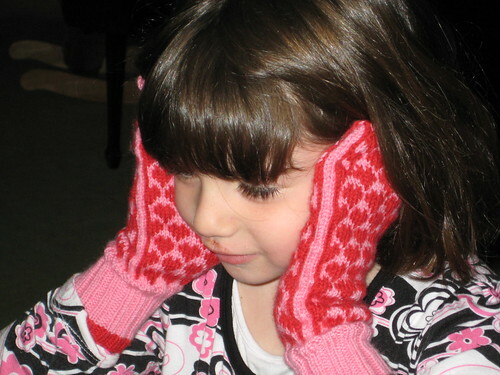 Anyway, she wanted snowflakes on the second pair. I found a small pattern I liked on the web, and tried a couple different approaches to make it fit. I think I’ve hit on the winner, so I should have this pair done by midweek, and then I don’t have to think about mittens again for a while. We had a few sets of visitors over the last few days: C and Dr. C from Seattle on Wednesday and Thursday night. It was nice to see them, and they were very good sports about my apparently attention-deprived children requesting stories to be read to them every time they sat down. We hadn’t seen since we went to Seattle for their wedding two years ago. I knew that Dr. C was a knitter, but hadn’t really seen her knit much when we were in Seattle. However, while here, she was in full-on vacation mode and knit every time she sat down and wasn’t either eating dinner, or reading stories to the kids. She was working on an enormous baby blanket. We went to the St-Jacob’s market, and found the Shall We Knit booth, where she bought more yarn for a pair of mittens (yeah, it’s all we do around here) so that she’d have something smaller to work on. I gave her a set of DPNs, since I never use them anymore, and she cast on that afternoon. She had never done DPNs before, and so she was all frustrated, but got the hang of it toward the end. Speaking of the Market – I’m going on Thursdays from now on! It was great! No crowds! I bought a pile of completely unnecessary cinnamon buns for everybody. So delicious! Then my parents came yesterday to hang out, for more than 24 hours this time! But I was not much fun to be around because I was felled by a head cold that hit me sometime Friday. It’s moving to my chest, so I’m feeling much less cruddy, but sounding a lot worse. Which is all kind of sucky because I have a concert to sing next Saturday. Bleh.